Doubling the temperature rise quadruples the anticipated damage. Curve shown is most conservative of three presented in new paper discussed here. I’m tempted to call it the decade’s most important paper on the costs of climate damage. The paper, just published in the peer-reviewed journal, Environmental and Resource Economics, upends the long-prevailing approach for estimating the social cost of carbon, potentially laying the ground for putting the SCC (in dollars per metric ton of CO2) into triple digits, from the $44 figure stipulated in rule-making by the Obama White House. The new paper, Few and Not So Far Between: A Meta-analysis of Climate Damage Estimates, is by Peter Howard, economics director at NYU Law School’s Institute for Policy Integrity; and Thomas Sterner, professor of environmental economics at the University of Gothenburg in Sweden. (Disclosure: Thomas and I have shared a warm personal friendship since the 1980s.) As the somewhat unwieldy title suggests, the paper combines data and results of prior analyses that sought to place a cost on future damages from climate change. 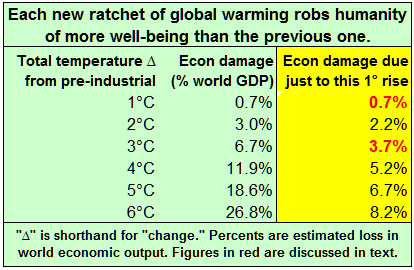 In those analyses, “damages” are expressed as a percentage of future global economic product — a somewhat cold-blooded metric that nevertheless allows policy-makers to compare the impacts of climate change on human well-being to the costs of mitigation and adaptation. The Howard-Sterner paper identifies several sources of bias in previous meta-studies of the temperature-damage relationship. There’s “duplicate bias,” by which early climate-damage models tended to be overly conservative but, because of their primacy, came to be cited multiple times, thus biasing downward the temperature-damage relationships in meta-studies. Moreover, methodological choices or constraints kept some analyses from accounting for non-market climate impacts such as reduced biodiversity or for so-called catastrophic impacts such as collapses of regional or global agriculture. Earlier analyses also failed “to control for whether market impact estimates [of climate damages] included potential impacts on economic productivity,” write Howard and Sterner. 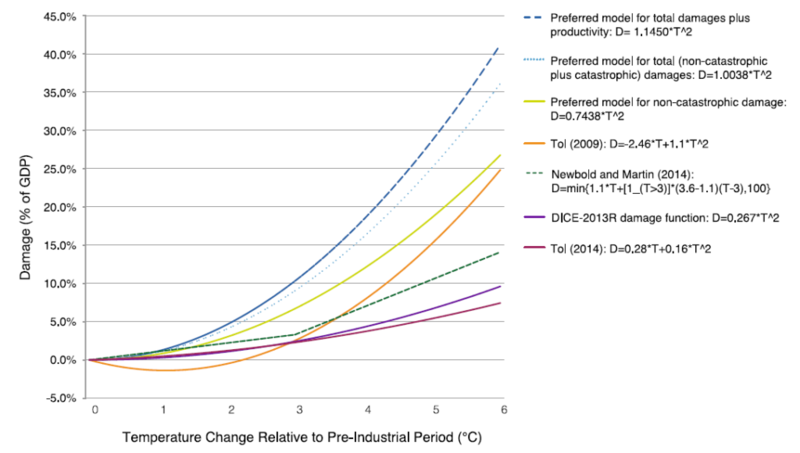 Though it may appear bizarre, until recently many attempts to estimate the temperature-damage function deliberately excluded the prospect that climate change will erode societies’ ability to generate new wealth by inhibiting the accumulation of technological and intellectual capital, which are key drivers of economic productivity and growth. In recent years, renowned climate economist William Nordhaus, whose Dynamic Integrated Climate-Economy (DICE) model and long-time intellectual leadership have been integral to estimating the social cost of carbon, has come under criticism for excluding non-market, productivity and catastrophic climate impacts from his modeling. Graphic from Howard-Sterner paper. We recreated their third-highest curve (“preferred model for non-catastrophic damage”) for our first graphic, above. As we wrote last Friday, in 2015 the Interagency Working Group (IWG) on the Social Cost of Carbon created by President Obama directed federal agencies to use a “social cost of carbon” equivalent to $37/ton in 2007 dollars. (Note that the official link to the IWG was scrubbed away by the Trump White House, in 2017.) That figure, which equates to $44/ton in 2017 dollars, was drawn in part from the “2013R” version of DICE. In their paper’s conclusion, Howard and Sterner point out that updating DICE as per their findings “would increase the resulting SCC of the Interagency Working Group by between one-and-a-half to twofold.” While that’s true arithmetically, it’s an understatement of sorts, insofar as their conclusion states clearly that “Using the preferred [model] specification, we find that the 2015 SCC increases by approximately three- to four-fold depending on the treatment of productivity.” However, that increase is attenuated by the IWG’s decision to derive their SCC not only via DICE but with two other temperature-damage models, neither of which are addressed in the Howard-Sterner paper. Thus, while the authors’ analysis would raise the estimate of the SCC derived solely from DICE by an estimated 209 percent, the need to average the increases for the DICE figures with the unchanged figures from the other models leads the overall increase to be considerably less, though a still substantial 63 percent. Even that lower rise boosts the social cost per ton of CO2 to $72, from the Obama administration’s $44 (both figures in 2017 dollars). That change is important since it warrants recalibrating the panoply of cost-benefit and other calculations that carbon tax advocates, corporate carbon-cutters and others have been basing on the social cost of carbon during recent years. But there’s more, and here we return to the equation we highlighted (and graphed) in the chart at the top. A possible increase in the global temperature rise from 2C to 3C is estimated to harm humanity ~5 times as much as the experienced rise from 0C to 1C, according to the Howard-Sterner equations. In their paper, Howard and Sterner tested various curve shapes to distill the set of temperature-damage relationships they sifted in their meta-analysis. Their most robust functional form was a simple quadratic, by which the total damage to global well-being (expressed as the lost percentage of global economic output) rises by the square of the temperature deviation from pre-industrial levels. Quadratic curves start slowly and gather steam — much as, when an object is dropped from some height, the distance from its point of release increases more with each passing second. 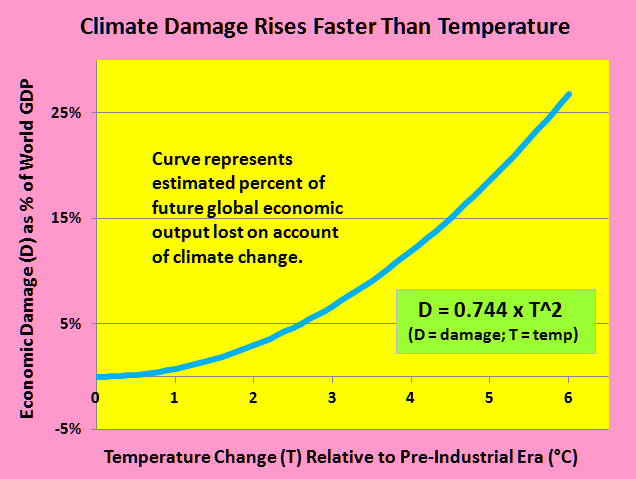 And so it appears with the Howard-Sterner climate-damage function, by which the additional societal damage from each new temperature increment is greater than the damage from the previous increment. (See table directly above.) In fact, the additional damage is a linear function of the temperature rise (as you calculus jocks will have noticed, since the first derivative of any quadratic function is a linear one). The implications are obvious but nonetheless profound. Arresting climate change isn’t binary, whereby we either stop global warming in its tracks or we don’t. It is, literally, a question of degree, with the importance of reducing and stopping warming intensifying as global temperatures rise. While that appears obvious, experientially — discomfort rises more when the mercury climbs to 100F from 95F than from 90F to 95F; and what goes for heat effects should go for drowned coasts, extreme weather, ecosystem stress, and so forth — now there’s an equation to codify it. Howard’s and Sterner’s quantification of the accelerating harm as global temperatures increasingly diverge from pre-industrial levels obliges humanity — all of us — to redouble our efforts to tax and eliminate fossil fuels and other greenhouse gas emitters at the fastest imaginable rate. Thanks for this informative report on what looks like a formidable analysis of the social cost of carbon, and for the link to the (freely downloadable) journal article itself. The finding that social damages increase more than linearly with climate change seems particularly significant because it adds a further reason for insisting on near term policy action. Another big reason why delays in acting are costly comes from the fact that CO2 accumulates in the air; each year’s postponement of putting an appropriate price on carbon means another year of mispricing carbon emissions, of which about half remain in the atmosphere (impacting the global climate in mostly negative ways) for centuries thereafter. It is not mentioned here what discount rate is used, or might be suggested, on the future costs estimated. This aspect also seems potentially powerful because (whatever mechanism is used to determine a rate for discounting the future) that rate would logically drop over time if -as is suggested- “climate change will erode societies’ ability to generate new wealth by inhibiting the accumulation of technological and intellectual capital, which are key drivers of economic productivity and growth.” More slowly increasing economic productivity not only makes it harder to “grow our way out” of future climate disruption (as Nordhaus’s early analyses seemed to suggest we might), it also computes to a higher present value cost of not acting right away to significantly reduce carbon emissions.